Two Message Box images are shown above. 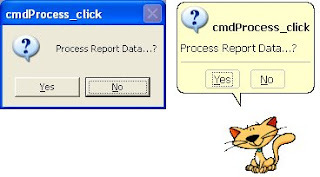 The left side Message Box is the default style of MS-Access and the one at the right side, with the Office-Cat image below, is created in Ms-Access with the use of Office Assistant in VBA Programs. The new programs uses the default Office Assistant’s features for Message Boxes. You can change the Animation character from the Tools Menu. By adding few VBA Functions in your MS-Access Project enables you to make use of this feature, wherever you need them in your programs. The function names shown above gives an indication as what type of Command Buttons will appear on the message box and which values are returned from User responses. Second Parameter Title is omitted in the second example. MsgOK "System is preparing to Shut Down","cmdExit_Click"
MsgOK "System is preparing to Shut Down"
The MsgBalun() Function is not directly used in programs. Implement the procedures in your Project and try them out.